Cora Dickson is a Senior International Trade Specialist in ITA’s Office of Energy and Environmental Industries. On a windy morning in early December, I stood on an observation platform gazing out over the sea of solar modules, and beyond that, the Pacific Ocean– or more precisely, Matsushima Bay, one of Japan’s “three most scenic spots.” I was joined on the platform by several U.S. companies, officials and colleagues from the International Trade Administration (ITA) and U.S. Department of Energy (DOE), and workers from the Tohoku Electric Utility who were taking us on a tour of their solar power station. The view was so breathtaking that it was hard to believe that in March 2011, the land where the solar panels now existed was covered by over 16 feet of water and debris from the tsunami. 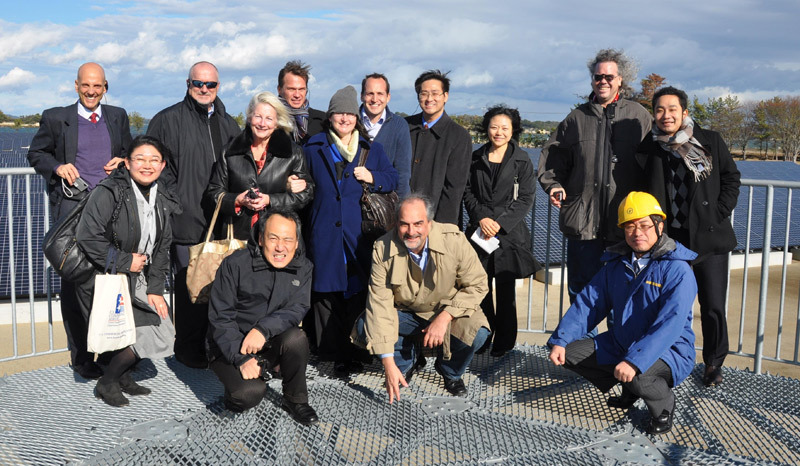 International Trade Administration and Department of Energy employees pose for a photo with trade mission participants and workers from the Tohoku Electric Utility on an observation platform above Matsushima Bay in Japan in December 2012. This was the final stop in our “Tohoku (Northeast) Tour” to Fukushima and Miyagi, prefectures that are committing themselves to rebuilding with green technologies after being hit hard by the earthquake and tsunami. The U.S. companies that signed up for the U.S.-Japan Renewable Energy Policy Business Roundtable in Tokyo on December 3 were given the option to take this tour, which also included courtesy call meetings with officials of both prefectures. Led by ITA’s Deputy Assistant Secretary for Manufacturing Maureen Smith and DOE’s Deputy Assistant Secretary Phyllis Yoshida, the trade policy mission accomplished its goals: to gain insights into the evolving policy and regulatory landscape for renewable energy and smart grid in Japan. It was tied to our bilateral discussions, known as the U.S.-Japan Clean Energy Policy Dialogue, allowing private sector input to guide the direction of cooperative activities between our governments. Prior to the trade mission, my office published a market intelligence brief, “Japan’s Electricity Market and Opportunities for U.S. Renewable Energy and Smart Grid Exporters,” to highlight the complexity yet attractiveness of this burgeoning market. While Japan is no stranger to renewable energy, it has revisited its policies and incentives due to several factors, including the March 2011 disaster that led to a shutdown of all but two nuclear plants in the country. There is even talk of structural reform in the electricity sector. 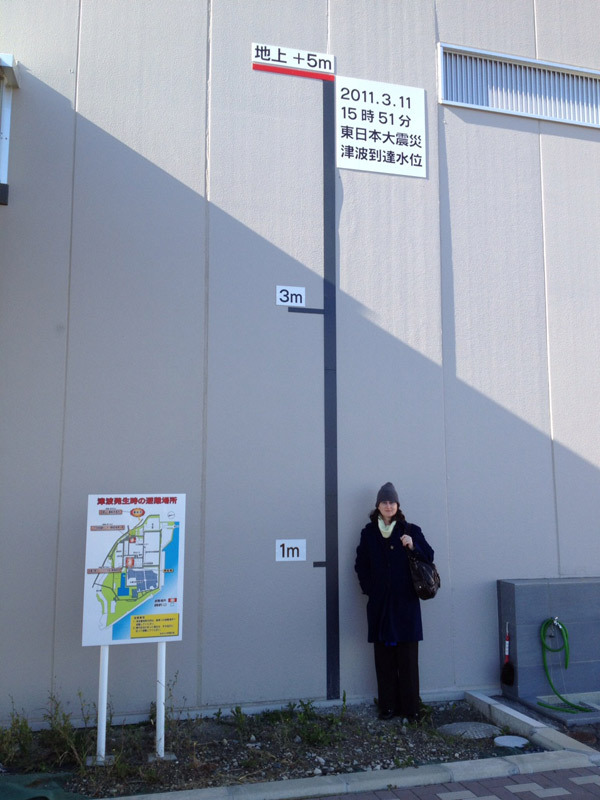 Cora Dickson of the International Trade Administration stands by a sign indicating the high water mark of the floodwaters at the Tohoku Electric Utility’s liquified natural gas plant following the March 2011 earthquake and tsunami. Another opportunity for U.S. renewable energy and smart grid companies to explore Japan’s market is coming up February 27-March 1 at the World Smart Energy Week in Tokyo, a Commerce certified trade show. Please contact Takahiko Suzuki if you would like more information. We will continue to shore up our alliance with the Government of Japan as well as Tohoku communities to promote clean energy. The Tohoku Tour allowed us to talk with local people about how they envision renewable energy and smart grid technologies will help them manage their energy needs in the wake of the disaster. On the same grounds of the solar plant in Tohoku, we also briefly visited the 400 MW liquefied natural gas plant operated by the same utility. It had been converted from a coal plant years earlier. The plant was strong enough to withstand the tsunami, though the workers told of how they retreated to the third floor for several days until the floodwaters receded. They had no power and they could not contact their families because all the phone towers were also destroyed. As our bus rolled back towards the city where we would catch the bullet train to return to Tokyo, we saw newly reconstructed houses on the coastline as well as abandoned foundations. These were solemn reminders that Japan is both vulnerable and resilient, and will take proactive steps towards a better future. We hope U.S. companies can partner with them to reach their goals.